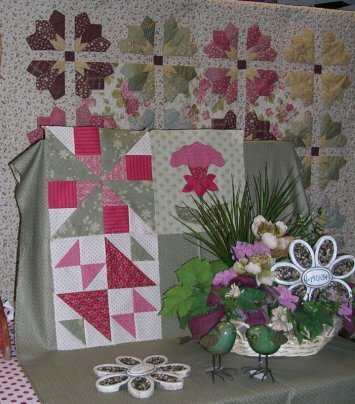 We just wanted to show you our three options for Saturday Sampler quilts in 2013. The pieced option is available in fall colors or red/pink. 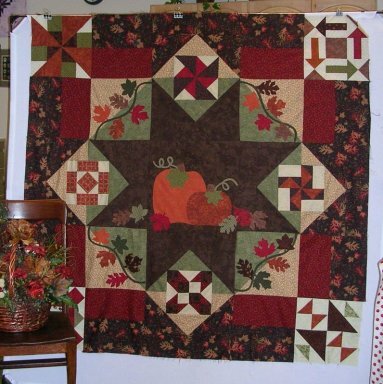 We have added some applique to our pieced quilt, obviously the fall colorway has leaves, pumpkins and vines. The red/pink colorway is done in gorgeous Blackbird fabrics and will feature stylized flowers, blooms, leaves, and stems. That sample will be finished by next month. Both quilts are striking and we hope you can see them at the store. Here is the Fall quilt . 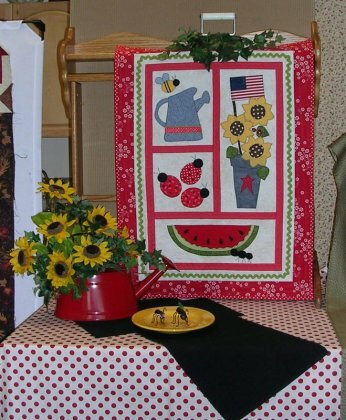 . .
And finally our Summer Sunshine wall quilt, a smaller project, all blocks have applique. This is our first "quarterly project", we'll offer two others throughout the year. Each project will have a different theme. We will be teaching applique at the Saturday Sampler classes and we'll also be offering applique classes where you can bring your own machine and sew. If you don't know how to to do fusible web applique, or invisible machine applique, this is a great opportunity to learn. Both are great techniques to add to your quilting skills. The new quilt guild "Rippin' Stitchers" meets every third Thursday. The next meeting is Thursday, Jan. 17 at 6:00 p.m. at Valley Fabric Shop. Everyone interested in the art of quilting is invited.